Affordable Web Designs Chester Limited. No hassle 3rd party claim. 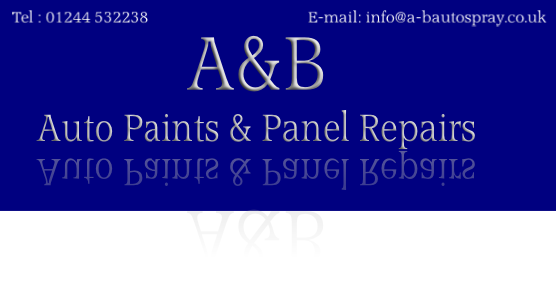 I had an accident and initially got in touch with A&B regarding the damage to my car paint work. After giving me a great quote, I also learned that they would help out with the stress of my 3rd party claim. They provided me with all the advice I needed, picked up and dropped off my car. Recommended what paper work needed to be completed and put me in touch with a handful of solicitors. It was an absolute pleasure to have such a reliable bunch of people helping out at such a good price. Thanks! When I damaged the side of my new car I was devastated. Only days after buying my car - it now looked a complete state. I called A&B, they picked it up, and within 2 days I had it delivered on my door step looking better than when I bought it. The work really was as good as a manufactures finish. When I had an accident I called A&B and they made the whole process so simple. From pick up to delivery, the quality re-spray and the handling of all the claim paper work - it really was so simple. As we said - customer service is key to our success as a company, but don’t take our word, see what our customers have to say.